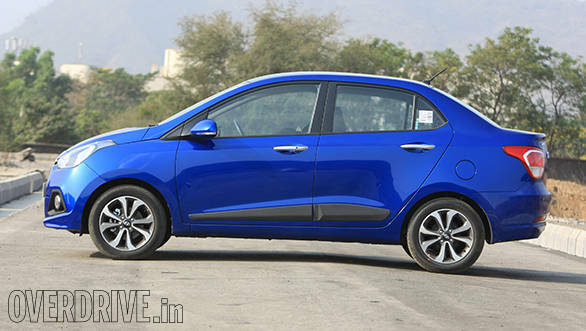 The Xcent starts at Rs 4.90 lakh, ex-Mumbai. A price most hatchbacks are priced at these days. 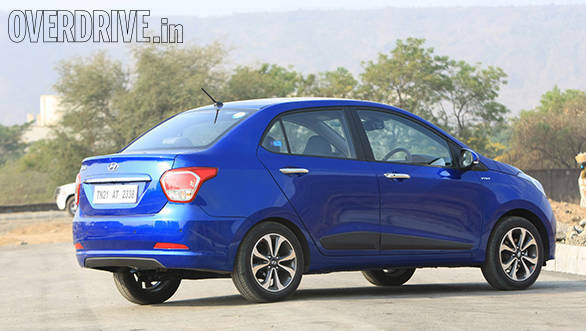 This makes it one of the most affordable entry-level petrol sedans available today in the Indian market. We have already compared the diesel version with its arch rivals, the Amaze and the Dzire but how does the petrol Xcent fare? 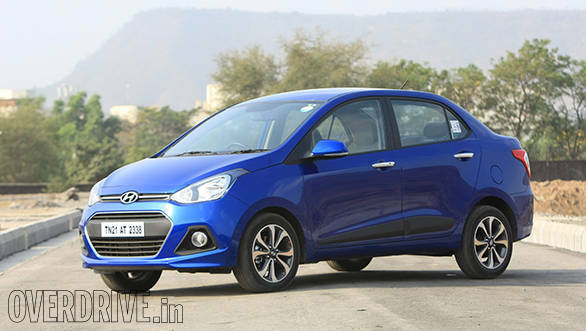 The Xcent is a booted Grand i10, so what you get is a rather smaller in footprint sedan. Well it is as long as the other sub 4-metre cars but when viewed head on and from the back, the car looks noticeably narrower, and that's because it is exactly as wide as the i10. The car does look proportionate from a few angles but in terms of design, it is no match to the rest of the Hyundais sold in the country today. The basic variants look rather bland but the top end variant, especially the SX option model you see here features attractive diamond cut alloys, angular waistline moulding and chrome accents that add a bit to the premium feel. 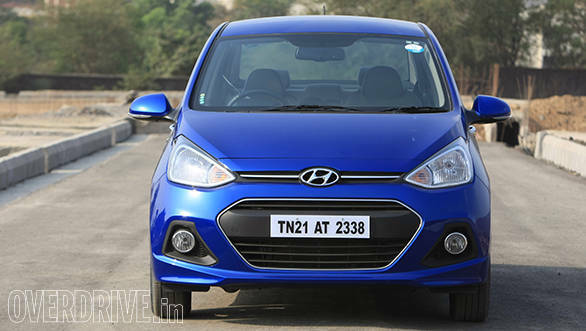 The face features the typical Hyundai hexagonal grille with a chrome outline to distinguish the car from the Grand i10 while the sides apart from the waist line moulding don't feature any prominent lines. The rear end is the least appealing angle, the tail looks boxy and the lamps could have been designed to go well with the overall theme. 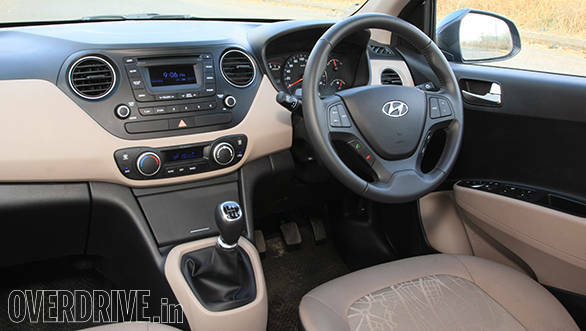 The interior however is well executed, the dual-tone dashboard looks smart and the attention to detail is good. 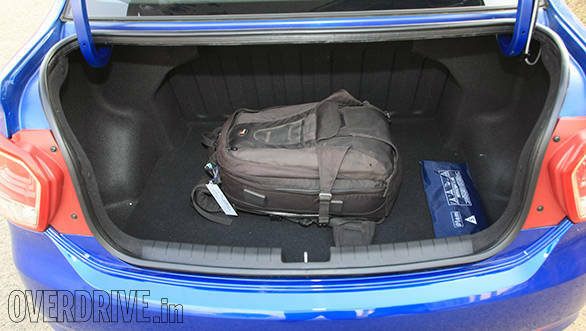 Smart packaging has also resulted in good cabin space and a large 407-litre boot (best in class). Styling and space apart, what about engine and performance? 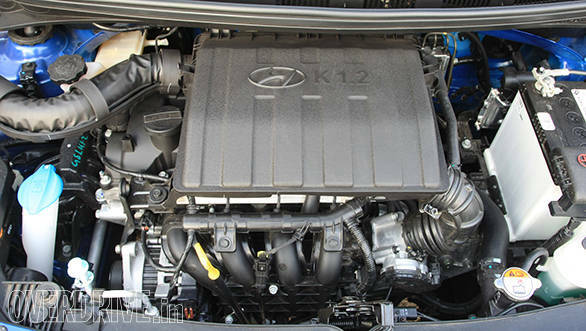 The Xcent's 1.2-litre Kappa motor has been borrowed from the Grand i10 and is also seen in the i20 hatchback. The 16V DOHC unit features variable valve timing technology that claims to offer good performance and efficiency. The engine puts out 83PS at 6000rpm and 114Nm of torque at 4000rpm. Out on the road, the engine is peppy while the shorter gear ratios go well with the engine's character. The sides apart from the waist line moulding don't feature any prominent lines. The car is quick off the block too, it takes just 12.9 seconds to hit 100kmph and maxes out at a respectable 159kmph. In the city, one does tend to shift gears more. Driving on the highway, the engine doesn't feel strained even at speeds up to 140kmph. The car even returned respectable fuel efficiency, in town the Xcent petrol did 13.9km to a litre of petrol while the figure increased to 19.1kmpl on the highway, translating to an overall figure of 15.2kmpl. The ARAI figure however is a claimed 19.1kmpl. An automatic variant is also available and can be opted only in petrol form. The Xcent even offers a good ride and absorbs potholes and broken roads quite well, since the cabin is insulated well, road noise is also well masked. The car comes to a halt quickly but brake feel could have been better. In terms of features the car is available in three variants, base, S and SX. The top variant offer a host of features like auto AC, stereo with 1GB storage, steering mounted controls for audio and phone, rear view camera, rear AC vent, arm rest with cup holders, keyless entry and start, multi information display ( misses fuel range option), optional 15-inch alloys and standard airbags. ABS isn't standard and only optional for both the S and SX variants. As we mentioned before, the Xcent petrol starts at Rs 4.90 lakh for the base model while the top end manual fully loaded SX Option can be yours for Rs 6.79 lakh. The automatic variants are priced at Rs 6.60 lakh and 7.55 lakh for the S Option and SX Option respectively ( all prices ex-Mumbai). At this price the Xcent starts at a much more affordable price compared to its arch rivals, making it a good value buy for someone looking to upgrade to a compact sedan.